PDF Stitcher (A-PDF N-up Page) is a simple and lightning-fast desktop tool that lets you to batch make N-up (2-up, 4-up) imposed PDF files as easy as drag-and-drop. With the help of PDF Stitcher, you are able to combine or rearrange PDF pages onto larger (or custom size) sheets to make books, booklets, or special arrangements. Stitch multiple PDF files in batches. Specify page range of a PDF to stitch. Rearrange page order in new single PDF page. Customize rows and columns of original PDF pages. Set the gap space between two original PDF pages in the single page. Resize margins of original PDF pages in new stitched page. PDF Stitcher enables you to make a foldable booklet from a PDF or arranging complex imposition layouts easily within minutes. Also, you are able to master the imposition (n-up page) process without professional training or complex job setups. Moreover, you can arrange pages on larger sheets, rearrange pages, trim pages and accomplish a whole range of imposition tasks. With PDF Stitcher, you are able to stitch multiple PDF pages into one PDF page and arrange PDF pages in new page easily. You can control the sequence, amount, layouts and rotation of pages in the new PDF page. The size of new single page is also customizable. Set page amount and layouts: You can sew many PDF pages to one page. You may set the page number in row and column. For example, you may set three pages in one row and 2 pages in one column in 2x3 (2-row and 3-column) pattern. 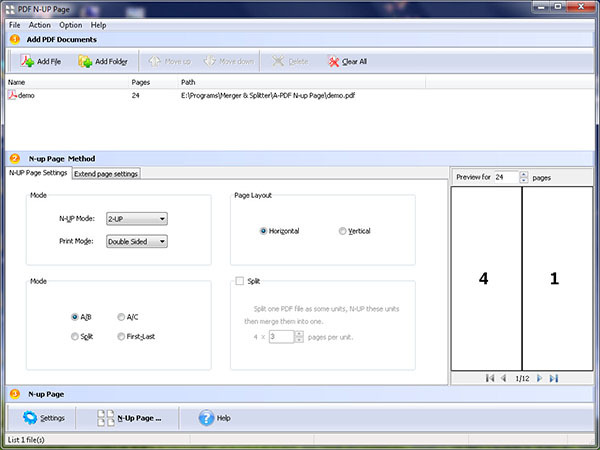 Arrange the sequence of pages: You can stitch multiple PDF pages into one PDF page. You can set the sequence of PDF pages in the new single PDF page. For example, you may arrange the pages in normal or reversed sequence in vertical or horizontal direction. Cross-plat form and two kinds of interfaces: There are two versions for Mac and Windows PC users. Therefore, you can choose a proper version for your computer. Furthermore, a command line interface is also bound with the GUI. With the command interface, you can call the application freely in, such as, shell scripts. Option 1: Draw lines between two original PDF pages. Option 2: Rotate the original PDF pages. Option 3: Rescale the original pages.